This recipe really gives it all away at once — cherry coconut sorbet with amaretto. That’s what’s in it: cherries, coconut and amaretto. Oh, and a bit of sugar. It’s really that simple. I’ve been eying the beautiful cherries at the market for the past several weeks now. They’re not exactly the cheapest fruit, but fortunately the price has been coming down to 20-25 shekels a kilo, and I usually make the splurge. It’s well worth it, because the cherries are juicy and sweet, and I enjoy every last one. For that reason, I hesitated to use so many of them in anything that didn’t involve just eating them red, shiny and intact. Eitan convinced me that cherry ice cream would be just as good as raw cherries. Fortunately, I can still buy more. 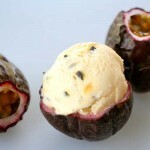 You can also check out my equally simple passion fruit coconut sorbet recipe, as well as my other ice cream recipes. Refrigerate the coconut cream in advance — if you do this, you won’t need to let the mixture chill before making ice cream. 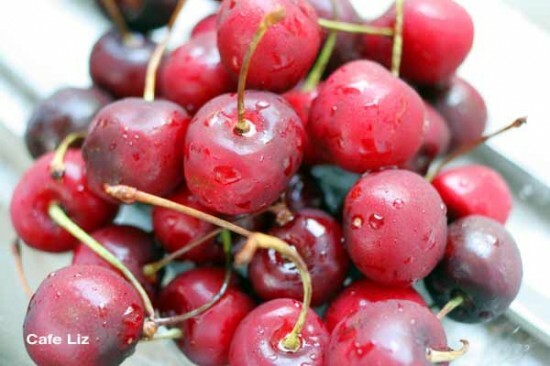 Remove the stems and pits from the cherries. Blend with a bit of the coconut cream until smooth (or slightly chunky — your choice). Mix in the amaretto, sugar and the rest of the coconut cream. Freeze in your ice cream maker according to the instructions, or about 30 minutes. 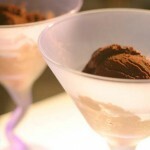 Once ice cream is thick and fluffy, put in a container in the freezer to harden for a few hours. 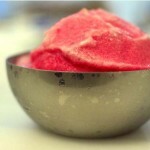 9 Responses to "Cherry coconut sorbet with amaretto"
I have to soon make this. Irresistible. I can vouch that this is in fact really good ice cream! Just remember to shake up the coconut cream before opening the can. And a higher cherry-to-coconut ration would also work, giving it a stronger cherry flavor. That looks absolutely a winer! The sorbet looks gorgeous. I faced the same thing with cherries- at such a high price I didn’t have the heart to make anything with it. But I finally gave in and made this peach and cherry jam and it was lovely! Had a question.. how did you get the pretty peach color? 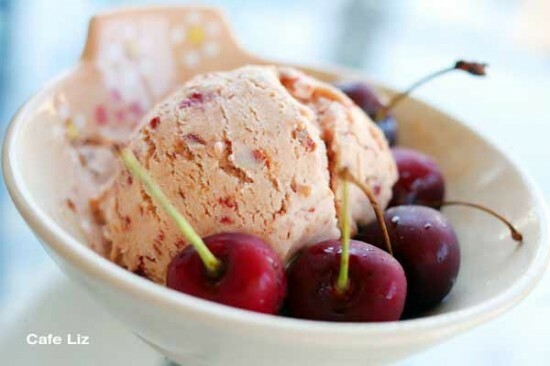 I made the ice cream yesterday with slight variation.. used coconut milk, same cup amount of cherries & almond extract since i did not have the amaretto.. mine turned purple like the crushed cherries..
I’m guessing that my cherries weren’t as ripe or dark red as yours … I can’t think of any other reason. I’d actually be happy if my ice cream were to turn out purple, that sounds very nice! Thank you so much for this inspiration! It became an instant favorite with all of us. I have posted it. Awesome! Loved your version as well.